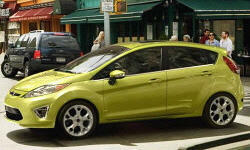 Ford Fiesta Handling Pros and Cons | Page 1 of 1 | Why Not This Car? For a car in its class, the handling is surprisingly quick and tight. The steering is direct and has very little dead zone. There's definitely body roll, but the chassis and capabilities overall are great for a $15,000 econobox. The Fiesta's compliant suspension isn't without a cost. The steering and suspension feel a touch squishy, even mildly tippy, on center. Push through the initial squish, though, and both systems firm up nicely, delivering reassuring feedback and control. Hustle the Ford through some curves, and it feels good. Overall, the best subcompact available right now. Honda Fit is best competition. This was a big factor why I bought the car. Very fun to drive! A drivers car.Precise handling in the economy segment in North America has been hard to find. Bravo!! It is a very smooth ride. It actually is a fun car to drive. Reviewers use "responsive" which is very appropriate. The road feel and stability rival larger models. This is an extremely nimble car. It turns on a dime, and the steering wheel feels solid in my hand. This is the best handling car I have EVER owned. It loves to corner and when paired with GOOD tires, it is absolutely phenomenal! Easily the best cornering car I have had in a long time. I found myself taking roads with more corners because I knew it would be fun to whip the fiesta around them.